Shut up! I am simultaneously attracted and repulsed. Seems silly. Seems cozy. Seems weird. Seems warm. Ella has mismatched Christmas socks from there. 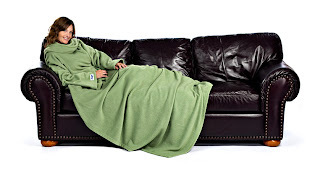 I'd be perfectly fine walking around looking like Friar Tuck in the comfort of my own home. Aimee,I am sorry, but I don't think you ned a slanket. I think you need some time-et!! Although, given the dream of having some time, one of those do look really appealing! I have seen ads for these things everywhere lately. I don't know if I'd be into the Friar Tuck look. I don't know, maybe.